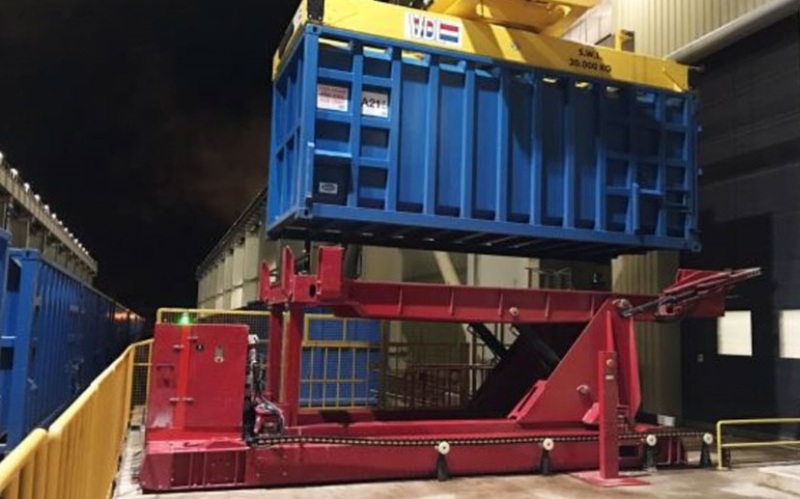 Waste to Energy Sita-Suez - Rail Mounted Unloaders. Sita-Suez built a brand new Waste to Energy plant in Wilton, UK where waste came to the plant via train in 20ft containers. A-Ward provided a customised automatic unloading system that moved and unloaded the waste from the train to the internal pit. Sita-Suez challenged A-Ward to supply three complete automatic container unloading systems. These needed to take the 20ft containers loaded with waste from the train to the pit and unload them. The new systems had to measure and store full and empty container weights, have full factory integration and diagnostics via PLC control. Sita-Suez requirements included a complete cycle time of the A-Ward Unloader of less than 164 seconds to meet their logistic costings. A-Ward designed and built specialized 20ft Flat Top Frame container unloaders designed with an extra load cell mounted between the upper and lower base frames, running the lower frame directly on railway tracks. The configuration made a stable structure for certified scale weighing on the moving Unloader. The complete operation of container loading, locking, movement, weighing, door unlatching, door opening, tipping including the empty weight check, plus extra container shake to remove stuck waste is performed via automatic PLC control. A-Ward designed and supplied special position control and locking systems that guaranteed that Unloaders would be in set positions during loading, unloading and tipping. Sita-Suez now has: A complete A-Ward designed solution that has revolutionized Sita-Suez productivity Reduced health and safety concerns for staff Reduced Sita-Suez shipping and local transport costs Reduced personal An innovative product by A-Ward, completely set up and working in automatic cycle smoothly was a fantastic outcome. A-Ward’s new system completed the cycle in 128 seconds, which was 36 seconds faster than required time of 164 seconds. The new A-Ward system has surpassed Sita-Suez requirements.